I got this mailer (image below) in my snail mail yesterday. The envelope grabs your attention because its looks like a billing envelope and has the same ominous warning FINAL NOTICE in big, bold letters. The envelope has the walking fingers logo just like in the image. If you are a particular age that is a pretty memorable logo that is always identified with the Yellow Pages phone books (and apparently not owned by anyone. More info below). It was probably because I have ads with YP.com that my heart did that little stutter-step-thingy and I ripped the envelope open instantly. The way the flyer inside is folded, the first thing you see is the part at the top of the image I circled in red. It took about a second and a half before it clicked with me and I remembered seeing this flyer before. And then after another couple-or-few seconds, I remembered I don’t get bills in the mail for my ads online. Never had. Mine have been auto-debited off a card from day one (so, I can be a little slow at times before I get some coffee in me). The scam works likes this: They are hoping the invoice goes to a busy office setting with a bookkeeper who is responsible for paying all of the bills every month. The invoices are made to work best if her employer has Yellow Page ads with bills arriving at seemingly random times every month. The bookkeeper here has never had a payment go in late and dimly feels the tiniest glint of pride at that fact. Although she doesn’t know it, and wouldn’t much care anyway, the scammy company sending these invoices out is targeting bookkeepers just like her. The kind that would never be mistaken for doing anything that slightly resembled, or could be reasonably confused with, someone actually “keeping the books.” Her job is dull. But as long as she writes out the checks on time, keeps the accounts balanced every month and never lets any dastardly late fees accumulate, she can go about her day, pretty much remaining unnoticed, knowing life can be much worse than this. So, when she sees the vaguely familiar fingers walking across the invoice and the bold FINAL NOTICE catches her view, the silent warning speeds her up by a step as the deeply-seated routine kicks in and takes over. Naturally thoughtless, she pulls out the checkbook just like a thousand times before. Then she fills in the amount that’s listed where it says DUE NOW. After sealing the envelope that is always enclosed, she presses down the stamp and tosses it in the bin. Dimly she this thinks, “no goddamn late fees gonna beat me,” knowing it will be in the mail by the end of the day. What the bookkeeper just started was an automatically renewing “contract” when she unwittingly sent the check for $298.00 to the scammy company. They bank on this slipping through the cracks just like this and then their bills being paid this same way. Every time I see these they always make me wonder how many of these the scammy company sends out every day? How many businesses thoughtlessly send in their money? The scammy company is banking on the invoice reaching a distracted small company with employees/owners that may be inattentive, too busy, careless or simply sidetracked , who all nonetheless dutifully pay their bills when they come in. I suppose if you send out enough of these invoices, the pure odds alone will wind up being profitable. I am always impressed by the ingenuity, thought and creativity that goes into these scams. If they applied those same skills in a legitimate manner, the scammers could probably wind up being very successful. You know, kinda like a respectable and upstanding member of [fill in the name of a profession that you dislike right here]! More info below the image. Be aware, be very aware! 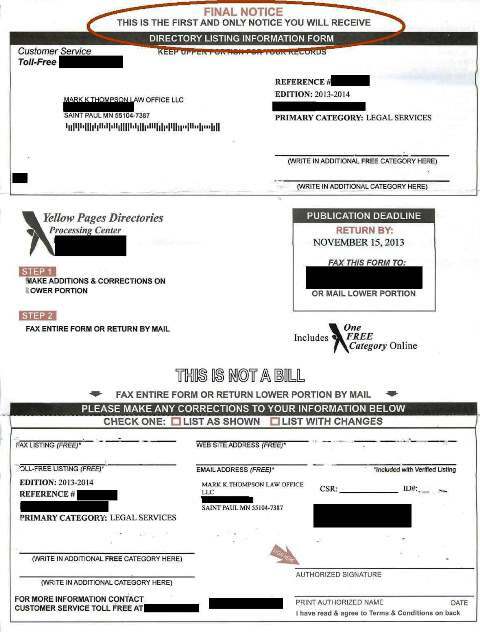 The Better Business Bureau has more info here (from January 2013–“This scam continues to gain steam despite numerous investigations and enforcement actions taken by the FTC) and Minnesota’s Attorney General does here (listing “clever tricks” employed in this scam– “the “let your fingers do the walking” or “Yellow Pages” logos are not trademarked and can be used by any directory publishing company.”).And KOBi2.com has a story here. (When companies did not pay the invoice, the scammy company got nasty and mean, “They would receive threatening letters, threatening phone calls saying they were going to report them to collection agencies and have lawyers call them”). via Lawyer’s response to client’s bad Avvo review leads to disciplinary complaint.